A list of all my articles on Wizzley, why I wrote them, and where the inspiration for each of them came from. I've been writing on the Internet for about 3 years now. By no means do I (nor should anyone else) consider myself a professional writer, even though I do make some money writing. But more importantly, writing allows me to be creative, to share ideas, to pass on knowledge, and hopefully through one of my articles, make a difference in someone's life. 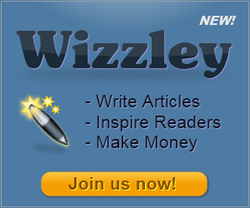 Here are links to all my Wizzley articles, and the inspiration behind writing each article. Back Stretches - I have back soreness from sitting too many hours at the computer, so I thought I would share some of the back stretches I do to help with my back aches and pains. Bike Safety - I wrote this after reading the astounding statistics on the number of people injured and killed on bikes. Boogie Board LCD Writing Tablet - I have this product (pictured on the left) and love it. I like to write reviews on products I own. Braided Easter Bread - Braided Easter Bread is an Easter tradition in our house. Here is my recipe. Candy Cane Cupcakes - I always bake these during the holidays. Delicious! Cheap Ways To Improve The Outside Appearance Of Your Home - I was planting some flowers in the yard one day and this idea came to mind. Christmas Martinis - Christmas (Candy Cane) martinis are my favorite alcoholic holiday drink. Common Job Interview Questions and Interview Tips - So many people are out of the work due to the economy. I thought this would be a useful article for the job seekers out there. Cooking Terms You Should Know - This lens came to mind when my niece called to ask me what "julienne" in a recipe means. Countdown Clocks - I just think these are really cool little gadgets. Crab Stuffed Mushrooms - Just thought I would share my favorite all time appetizer. Easter Basket Cupcakes - These Easter egg basket cupcakes are just too cute to not write about. Eggnog - I was thinking today how Christmas is only 6 months away. Now is the time to get those holiday article ready. Employee Appreciation Ideas - I was thinking about my old boss one day and how crappy she was to her employees. That was the inspiration behind this article. Entertainment On a Budget - I was ordering tickets on StubHub one day and this idea came to mind. Gas Saving Tips - I was at the gas pump, paying an arm and a leg for my gas, when the idea for this article popped into my head. Grilling Basics - We grill a lot. I wanted to share some of our grilling knowledge. Hotel Safety - I traveled alone for the first time. I realized that hotel safety is an important subject, and one not many people think about when booking their hotel stays. How Much Sleep Do We Need - I was tired when this lens came to mind. How to Choose and Protect Your Passwords - The inspiration for this article was the hacking of my own computer. How To Get Rid Of Mice - My mother-in-law had a mouse in her house. I assumed other people must have them too, so I wrote an article on how to get rid of them. How To Keep Family Medical Records - I'm the genealogist in our family. I have 4 5" binders filled with our family tree information, and I have a binder filled with all our family medical history. How To Love Your Spouse - Now sure what inspired this article. I was probably in an argument with my husband that day. LOL. How To Negotiate Almost Anything - My cousin is getting married next month and I was telling her to negotiate with the wedding venders. Hence the idea for this article. How To Open A Zazzle Store - I have a Zazzle store. Just wanted to share the information I learned. How To Prepare For A Job Interview - Having interviewed over 800 people in my previous job, I thought I would share some of my advice with job seekers. Identity Theft Protection - My husband was a victim of identity theft. Kiwi Cake- Had a craving for kiwi cake on the day I wrote this article. Laundry Tips - My daughter had a pink shirt on one day that use to be a white shirt before she washed it with her red clothes. That was the inspiration behind this article. Menopause – My Story and More - Like the title says, "My story". No Bake Berry Cheesecake - I like "no bake" recipes. Thought I'd share one of my favorite no bake cheesecake recipes. Peppermint Sugar Cutout Cookies - Another one of my favorite holiday cookie recipes that I wanted to share. Rent-A-Grandma - Need a grandma? Rent one! Yes, you can actually rent one! I read this company is franchising nationally. Thought it was something interesting to right about...since very few people know that you can actually rent a grandma. Shamrock Shakes - Was wishing I had one of those green McDonald's shakes today. Since they're not in season right now, I had to make my own version. Sleep Paralysis – A Terrifying Experience - I experienced a sleep paralysis once. It was terrifying! I never heard of them until I had one. I figured a lot of other people probably never heard of them either. These can be very terrifying if you experiece one and not know what they are, so I thought I'd share my experience and write some information about them. Snickerdoodles - I love these! The Myths About Salads - I was eating a lot of salads until one day I realized that I was consuming more calories than I would if I ate a Big Mac! That's what inspired this article. Weddings On A Budget - Not planning a wedding but I really enjoy writing about them. I've written a listography, a lensography, and even taken photography, but I've never written a Wizzography. Here we go! Wow! Your work here is exceptional. You sure don't waste time.